Follow Michael’s journey as our Dr David Murnaghan not only restores his smile, but also his confidence and general health. Michael is 32 years old, from Ashbourne, a family man with children. He has endured for too long the “shame and embarrassment” of living his life blighted by a mouthful of decaying teeth. Whilst he has learned to smile and talk without showing his teeth, his children have begun asking questions. His younger son (who has autism) shamed him recently with his questions on white teeth. So he decided to change, to pursue the operation that he hopes will transform his life – and for the better. He is undergoing this in a very public forum as he wants to let others know about the dangers of neglect and sugar and also that it’s never too late to change. Socially, Michael has been refused entry into pubs. Below he talks openly of the difficulties he has faced. VIDEO 2: Full Interview with Michael Sheridan explaining the devastation years of neglect and addiction to fizzy drinks had on his oral and dental health and his hopes for the future. 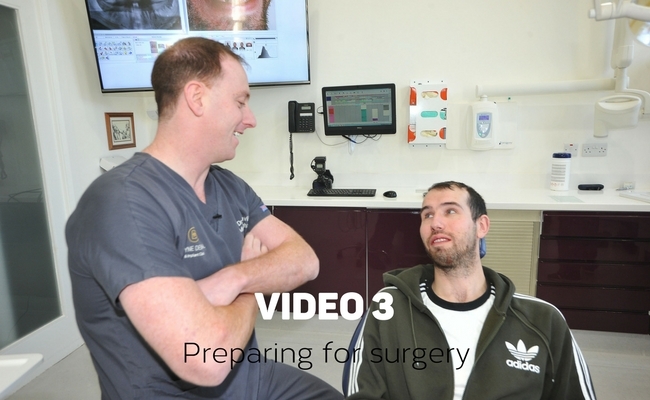 VIDEO 3: Meeting Dr David Murnaghan from Boyne Dental and Implant Clinic who, inspired by Michael’s story, carried out the surgery and implant work to restore Michael’s smile and self-confidence. Michael Sheridan undergoes radical surgery to remove all 27 rotten teeth in just one morning under the care of Dr David Murnaghan at Navan’s Boyne Dental & Implant Clinic. 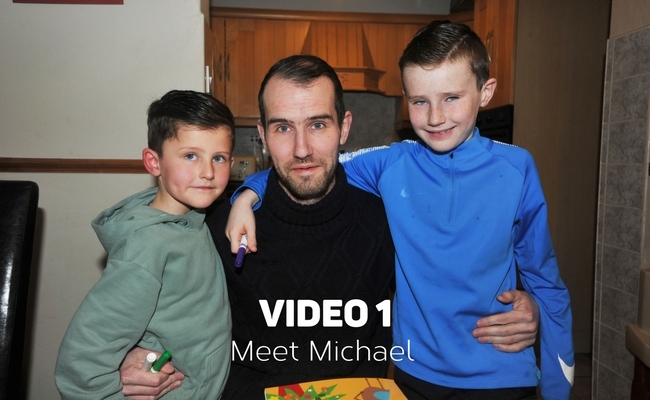 One week after his surgery Michael speaks about returning to work and re-finding his smile…. 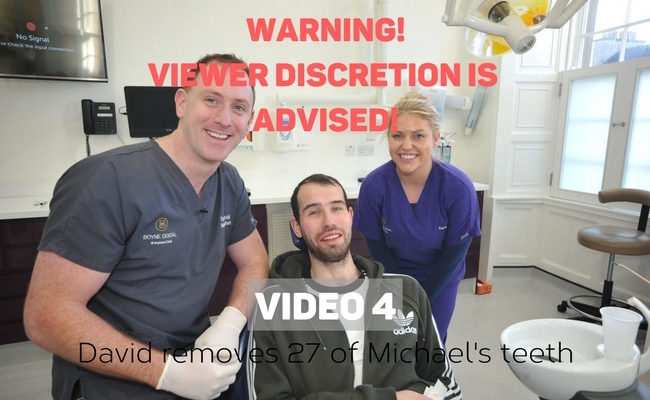 Whilst Dr Murnaghan he is a highly experienced dentist the Michael Sheridan project left him confronting challenges he had never faced before such as the removal of Michael’s 27 teeth in one session, something he has never done before with a young client. David talks about how many of Sheridan’s teeth are worn down but they still have deep roots. While David is happy to help out Michael also wants to get the message out there that ignoring dental problems can only mean trouble – and big trouble at that – in the long run. Like Michael, David is stepping outside his comfort zone. Two young men pursuing the same objective but from very different directions. Whilst Michael knows that his journey is only half way through he says that he is delighted that he has re-found his smile after having all his remaining 27 teeth taken out and replaced with dentures. After a period of healing time, Michael will have 12 implants placed for Dr Murnaghan to restore with bridges. This will eliminate the need for dentures. So, the best is yet to come for Michael! “Every person I meet is asking me to smile now, ‘show me your teeth’ they keep saying to me. I have no choice but to smile, everyone knows that I’ve had the work done and the dentures in. It’s good to be recognised for something good now rather than having to hide away,” he said a few days after the operation. “There’s a small bit of pain there but you know I’m so used to having toothaches over the years I’ve probably become immune to it,” he said. “The pain I’m having now is nothing compared to some of the toothaches I had. Michael’s journey has only started. It will be months before he has his final permanent smile but waiting on Michael’s transformation is no reason for others not to start their journey’s too…..from washing your teeth, to reducing sugar intake, to taking advantage of the free dental exams (general dental health, oral cancer screening and gum health which can help identify many illness, including diabetes, heart disease and many other risks), and Hygiene exams being offered under PRSI.